I’d like to share with you this invite from Kanebo Philippines. They are inviting us beauty enthusiasts to their Private Sale and Beauty Workshop here in Cebu City. You will have a chance to experience the Kanebo Beauty Workshop. It will be held at Marriot Hotel here in Cebu City on February 28, 2013 at 1:00 PM to 5:00 PM. Learn how to look fresh in vivid colours together with their local guest makeup artist, Mr. John Rubi. 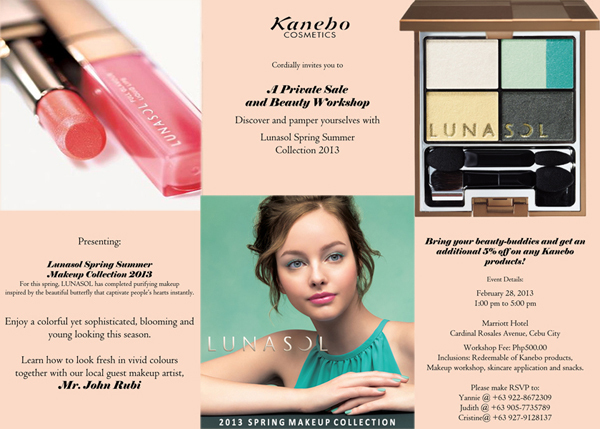 You also get first dibs on the Lunasol Spring Summer Makeup Collection 2013. Workshop Fee is only Php 500.00 and you can use that to redeem Kanebo products. The event will include a Makeup Workshop, Skincare Application and Snacks.